Brach's Christmas Nougats are a classic Christmas candy. They are a disk shaped nougat candy wrapped in cellophane. These are most recognizable by the little Christmas tree in the center. 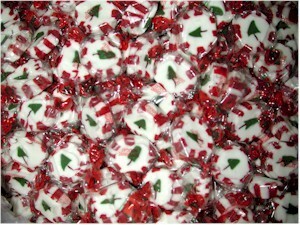 These are a very popular candy for the holidays and come in a variety of flavors. 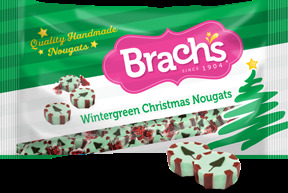 For those not fond of peppermint, you can also get nougat in a cool Wintergreen flavor nougats. These are not as easily found as the peppermint. 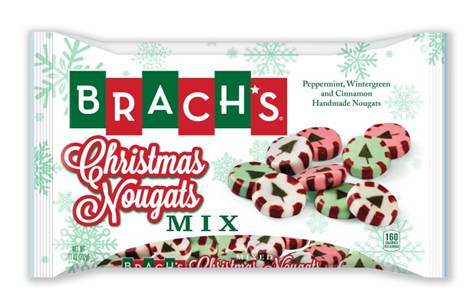 Now for those of you that like all the flavors of nougats there is a Christmas mix bag. You can get an assorted bag of peppermint, wintergreen and cinnamon flavored nougats. At one time you could get a bag of just cinnamon flavor nougats, however cinnamon was not very popular and for a while they were discontinued. Due to a small demand they were brought back, but they are only available in the Christmas mix bag. Brach's made it very easy to tell what flavor you are getting by the colors. All of them have the red stripes around the edges. The ones with the white centers are peppermint, the green centers are wintergreen and the red / pink centers are cinnamon. 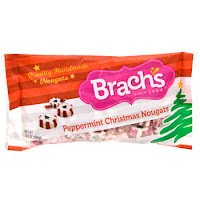 Brach's Christmas Nougats are a tasty treat to fill your candy dishes with. For many it is a tradition to have these every year. I am amazed at how many kids actually like these nougats. I am not sure if it is for the taste or the cute little trees in the center.